When are Burnley's players on international duty for England, the Republic of Ireland, Wales, Canada and Iceland? Nick Pope during England training. A host of Burnley players are in action during the international break. Clarets stars are away with England, the Republic and Ireland and Wales amongst others. Kevin Long in action for the Republic of Ireland. Sean Dyche’s side return to action in the Premier League at bottom side West Brom on Saturday, March 31. Nick Pope and James Tarkowski are hoping to make their Three Lions debuts after being handed their first call-ups by Gareth Southgate. England face Holland in Amsterdam on Friday night before hosting Italy at Wembley on Tuesday night. Both games are live on ITV. Jeff Hendrick will be in action for Ireland again. Tom Heaton still harbours hopes of breaking back into the squad ahead of this summer’s World Cup in Russia, Pope having excelled in his absence. Joe Hart, Jordan Pickford and Jack Butland are the other goalkeepers in the squad. Jeff Hendrick and Kevin Long are with Ireland for their friendly in Turkey on Friday night, March 23. Kick-off is 5.30pm. The game is being broadcast by RTE but is not available to watch live in the UK. Sam Vokes is a mainstay of the Wales set-up. Robbie Brady and Jon Walters miss out through injury while Stephen Ward is only just back in action after his knee problem. Sam Vokes is part of Ryan Giggs’ first Wales squad for the China Cup. They play the hosts at 11.35am on Thursday with Uruguay and Czech Republic playing in the other semi-final. There is then a final and third-place play-off on Monday. All Wales’ games are live on BBC One Wales. Scott Arfield is likely to line up for the Canucks against New Zealand when the sides face each other in Murcia, Spain, this Saturday, March 24. Kiwi captain Chris Wood is not involved with the All Whites having only recently returned from injury. 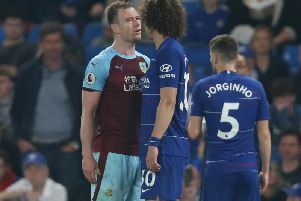 Clarets winger Jóhann Berg Guðmundsson could win his 64th cap when Iceland face fellow World Cup finalists Mexico on Friday, March 23 in a friendly at Levi's Stadium in Santa Clara, California.